The idea of cauliflower soup seemed like a bit of a let down after making "the fabulous" beef daube last week. Also, my kids hate cauliflower! I prepared the soup and even pureed it while they were at school. I made a big deal about the truffle oil that I bought to top the soup... telling them the history of forging for truffles... etc. Yes, I was off on a taste tangent. They both said that the soup smelled terrific, and they were pretty excited about eating dad's sourdough bread. I put some very runny French cheese on the table, and went to walk the dog. When I returned the kids were ready to eat. Then my husband said, "Can't wait to have the cauliflower soup." My daughter looked at me, "Cauliflower!" My husband blew it. But my kids know that they have to try what I cook before they condemn it. My daughter sat silently buttering her bread and picking at the cheese, apples, and pears that accompanied the soup. Finally she ate it. "This isn't bad. Truffle oil even makes cauliflower taste good." The rest of us loved the soup, with or without truffle oil it made a wonderfully light vegetarian dinner, which is a good balance to beef daube. Note: I added 1/4 cup of half and half, 1 tablespoon of White Truffle oil, and 1 teaspoon of fleur de sel to the original recipe. Well...I really like Cauliflower but I never tried it for soup. But now I will try it for sure with your recipe. thanks for posting this healthy recipe. I don't find cauliflower very exciting either, but it is really good in a soup with or without truffle oil. I was surprised at how good it is as a soup. Mmm, we love cauliflower! I've never thought of turning it into a soup though. Neither did I, if you guys already like cauliflower you are going to LOVE this soup. I didn't have to put much but it did improve the texture. Truffle oil is going into my next batch of soup! Perfect flavor Diane! If you like mushrooms, truffle oil is heaven in a bottle. The white truffle oil is lighter and more versatile than the black oil. I'd have to say I'm with your daughter on this one! It was okay, but only with the garnishes. Your soup looks absolutely beautiful, though! I certainly wouldn't mind giving it a second try! She'll be happy to hear support for her position, thought she really didn't mind this soup. I'm really not that good at being sneaking. What else do you use truffle oil for? I had it for a salad, but I would like to use it more. Happy to hear that the whole family liked it. I used truffle oil too and thought that it was a great (and easy) topping. What else do you do with your truffle oil? I love it so much I want to bath in it, but it is a little expense for that. 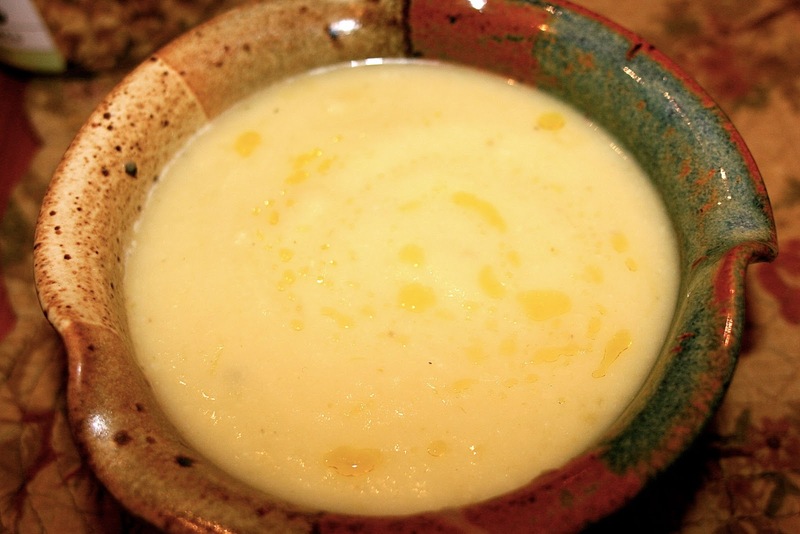 If truffle oil can get kids to eat cauliflower soup then I must get my daughter in law some! Your soup looks delicious! If her kids like mushrooms truffle oil will work. UUMmm!!! Truffle oil. Great Idea! Kids are funny when it comes to food. Glad it was a hit, kinda, sorta!! Lets say she ate it without too much complaint. This Posts says even more about your kids' sophisticated eating habits which I've mentioned to you before. Truffle oil? ( I've never purchased it before.) Melissa, my daughter, just told me she has cauliflower on hand and is making it into soup for tonight's meal - a new vegetable for the little girls to try. Yikes! I asked her not to mention "Grandma" and "cauliflower soup" in the same sentence. That being said, I liked this soup and will make it again and often. But, I also love cauliflower. Diane, if it's a topping of walnut oil and toasted walnut (which I used) or Truffle Oil (which you used), I'd put my money on yours. So, you missed out on nothing by not going with the nuts! I love walnut oil... now that is wonderful in apple salad hmmm. Yes, my kids are truly foodies. I told them both that they should work in restaurants when they are in college. I say the same thing I don't run a restaurant. I try to routine meals so at least one person is happy per dinner, but with the Dorie recipes they usually surprise themselves and like it. I have never had truffle oil but after reading all the comments, I will have to give it a try. Your soup looks fantastic. We enjoyed it and I am sorry I had only made half the recipe. The smell of the oil is amazing. Get the white oil definitely lighter. Truffle oil was a great addition to the soup. I am glad your kids enjoyed it. It was a hit in my family also. Truffle oil! Such a great idea! If I didn't have a mighty mushroom intolerance I would use it in everything!!! - kidding - but still great idea to lift the flavour of this soup!!! I hope you don't have an allergy to mushrooms. I have so many other foods that I am allergic too, so glad I can have mushrooms and shellfish. Oooh, I need to try this with truffle oil. YUM! I didn't find it too strong in the cauliflower flavor. My kids liked it, too. Kudos to you, for having your kids try new things…I always had a rule when my kids were young...They didn’t have to eat it if they didn’t like it, but they always had to try it! They are all grown now and very adventurous eaters! Your soup looks wonderful and I love the addition of truffle oil…yum! Thanks Kathy, I can't tell you how many people think I force my kids to eat new things. I have just always "expected" them to try things. The same as you, if you don't like it you don't have to eat it. Kids live up to expectations and even though my son is going through a weird anti-green thing right now. I know he will be a adventurous when he gets older. My mother always called that "Green Eggs and Ham". I'm glad that this was a surprising success for your family. The truffle oil was a great idea. I'm going to have to try that. Have a great week. Sorry your husband spilled the beans - especially after you had gone to such lengths to distract them from the cauliflower but I'm glad it turned out well in the end! Thanks Maggie... I think they might not have even know about the cauliflower and would have just loved the soup. OH well. What a nice story! It sounds like your kids are sophisticated eaters already. The bowl in your top picture is lovely, too. It is a little scary how much they already know about food. Thank you about the bowl it is from a local store and an area potter. No it wouldn't have the same effect. If you saute some mushrooms and garnish the soup with them that would be similar. Truffle oil smells and tastes of mushroom.